I spent an afternoon recently with Alison from Viv@ellada in downtown Athens, wandering about and trying different food. 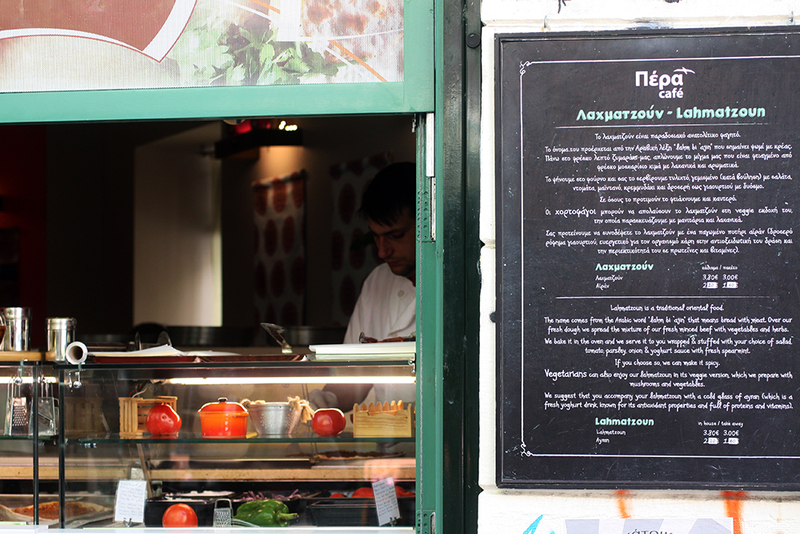 Alison will have a post about ‘cheap places to eat’ in Athens that I will link up here soon. (Update: Here it is! ‘Had Enough Of Souvlakis?“)I have decided to compile here some of the places that we went to, for food and for food shopping. The theme here is Eastern Flavours, and I will tell you about Street Wok, a recent find for me, that I absolutely LOVE; Pera Cafe that serves really good Lahmatzoun; and Mirch, an Indian restaurant and take-away that serves really good Indian food – they have a Tikka/Tandoori oven that makes their chicken tikka and tandoor taste extra delicious! 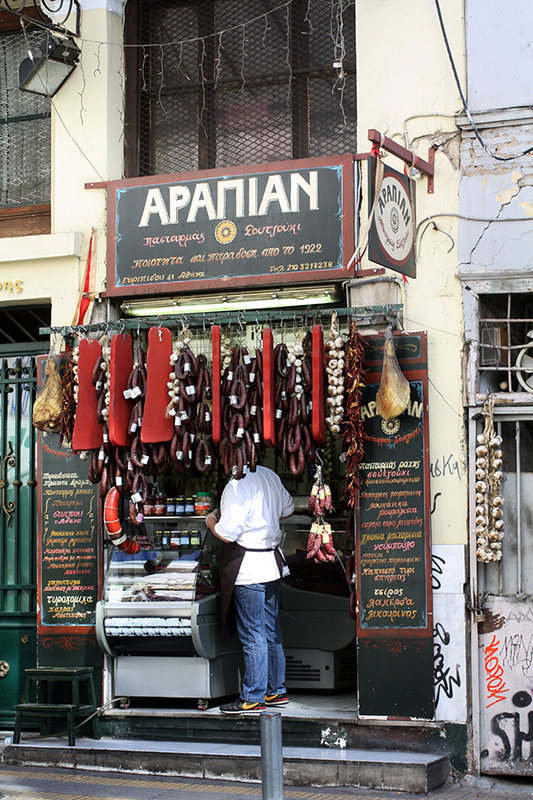 Also, a shop (a very famous one, too) that sells the speciality cured/dried meat Pastourmas – called Arapian. There is a connected restaurant Ta Karamanlidika Tou Fani that I would try some time in the near future. I have to say that I really do love this place. Reminds me of foodcourts and stalls back in Malaysia, where you can eat freshly cooked stir-fried rice or noodles (Nasi Goreng, Mee Goreng, etc.) You can choose your base – egg or rice noodles, or rice, or just plain vegetables, and then add extra ingredients of your choice, plus toppings, and then choose your sauce. They cook it there and then, and you can enjoy them immediately. 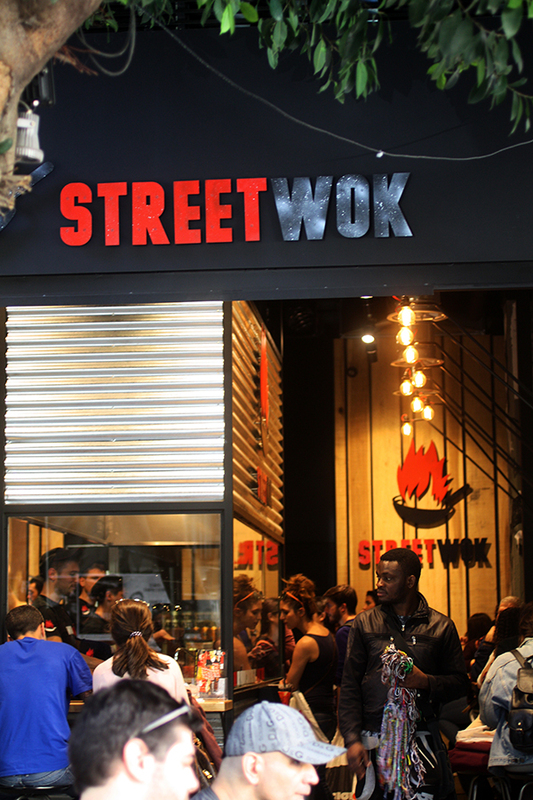 I mean, look at that wok action video above! This branch is in the city centre, in Aiolou Street, but they have 2 other branches in Ambelokipi and Nea Erythraia too. It is quite difficult to find an affordable Indian food eatery here in Athens. Most of the restaurants are of the higher end of prices, and this place is a refreshing sight – a good meal like ‘back home’ that doesn’t cost my firstborn and my husband’s left kidney. They have a range of biryanis and curries, and, my favourite, Chicken Vindaloo. I tried the ‘Indian Souvlaki’ and the fresh naan bread and chicken tikka was cooked in the traditional oven – it was marvelous! I have to say, I will be back to this place more often, even though it is a bit far from home. 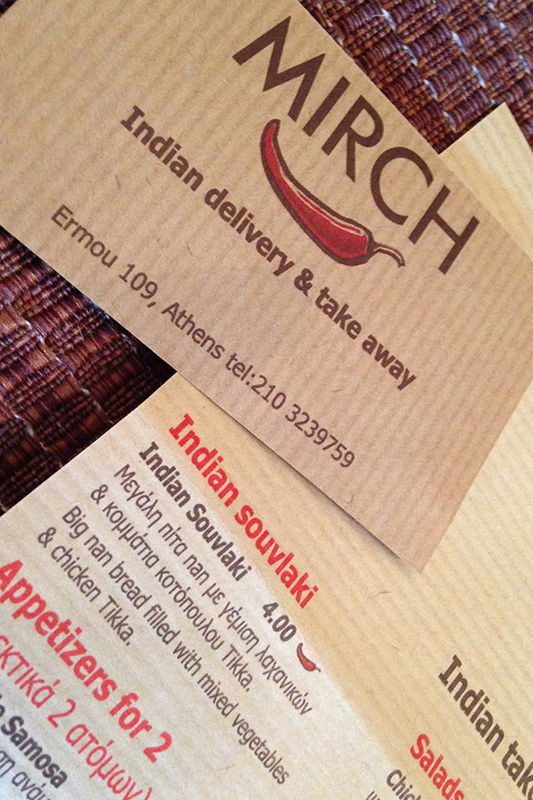 Mirch is located on Ermou, but further down after Monastiraki from the usual shopping area of Ermou (near Syntagma). I have always walked past this café, but never really stopped here. I am usually waylaid by falafels at Falafellas. We decided to buy lahmatzoun for our other halves on our way home. 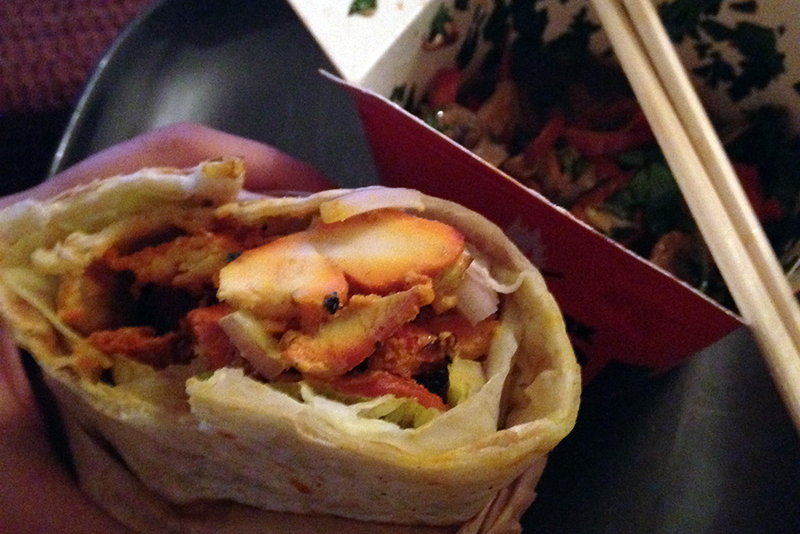 You can find other items on the menu – falafels included. What is lahmatzoun? Because of the way the meat is added on top of a flat piece of dough baked in the oven, I have always thought of it as a pizza, but without the tomato sauce or cheese. 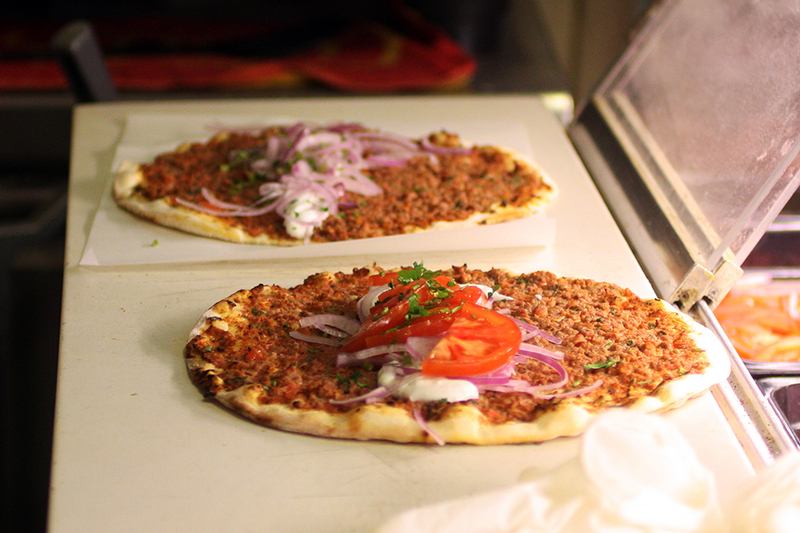 As I’ve said, it’s a thin piece of dough, baked in the oven with a layer of minced meat and vegetables on top, and after it is baked, then topped with salad vegetables – tomatoes, onions and sauces. It’s a very aromatic and wonderfully tasty dish. I have yet to find a better place that serves lahmatzoun. Thumbs up from me! This was an interesting experience for me. We were wandering about with no purpose around the market, and stumbled upon this lovely gem of a place. The guy behind the counter, Andreas, was very nice and kind to us. 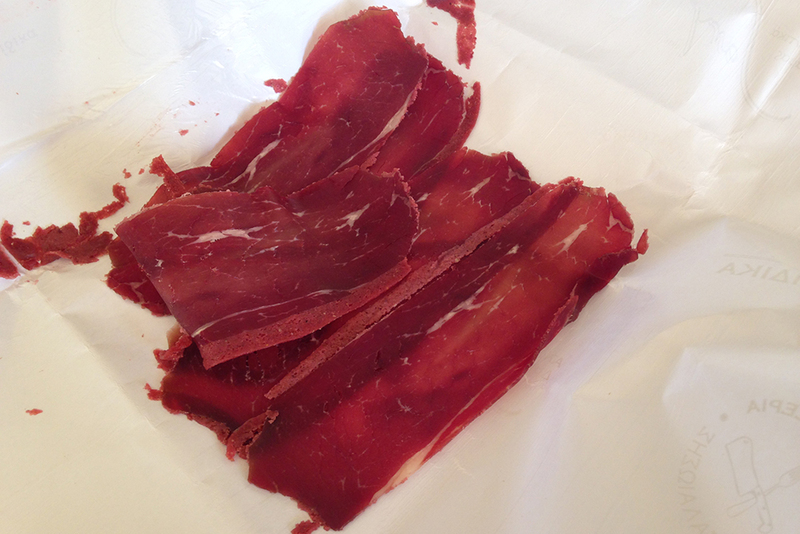 We tried the cured/dried meats on offer and we bought a variety of meats. The speciality of this shop is of course, Pastourmas. 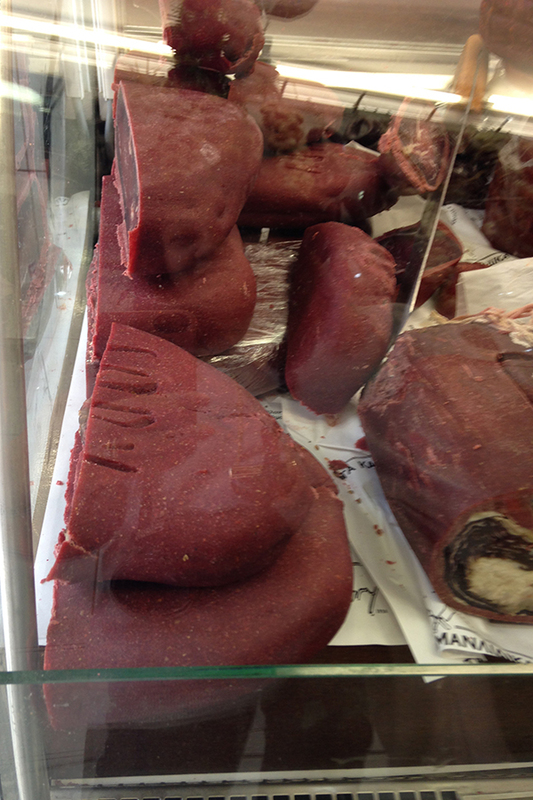 It’s cured beef covered with spices – fenugreek, cumin, allspice and paprika. 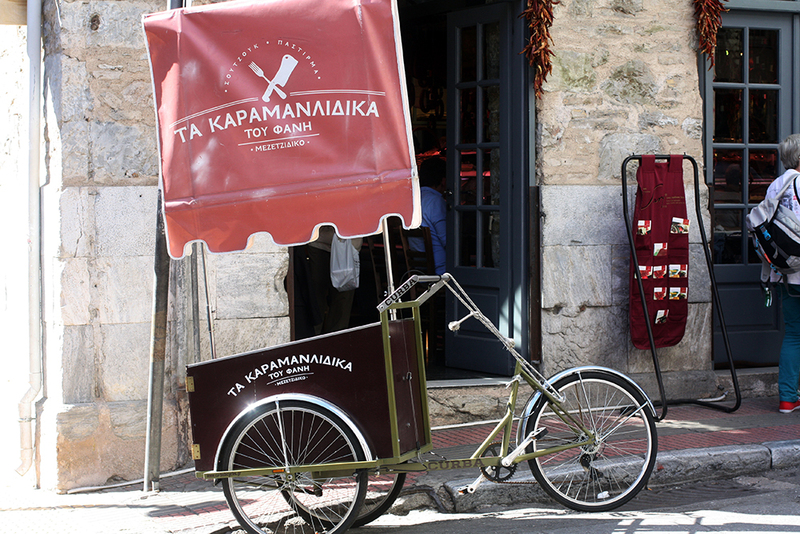 There is also a restaurant close by that serves the famous pastourma, and other dishes and specialities of Greece. I would love to eat there one of these days. Sunday morning breakfast – fried eggs with pastourmas. It was incredibly tasty. How could I have not encountered this heavenly (albeit strong-smelling) morsel before this moment? I have been here in Greece for quite a number of years, and have heard of pastourmas (and eaten it too, I suppose, yet not knowing what exactly is it that I am eating! ), but I have to say this trip to the store really opened my eyes, and I thoroughly recommend you to check out Arapian, and ask for Andreas! 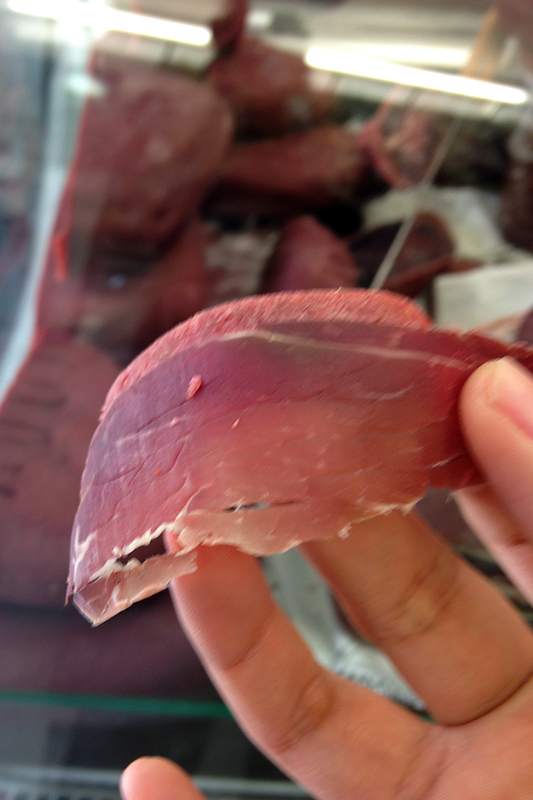 He was extremely helpful, and we had a wonderful time tasting all the wonderful meats on selection. 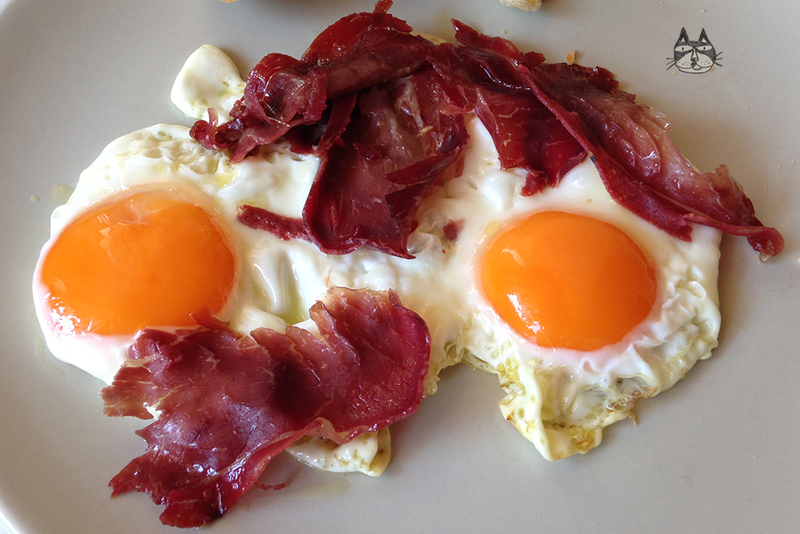 How to make Fried Eggs with Pastourmas: In a frying pan, gently heat 1 tbsp of olive oil. Break 2 fresh eggs into hot pan, careful to not break the yolk. Once the whites of the eggs has started to cook, place a few slices of pastourmas into the pan – on the eggs and by the side to slightly crisp up the meat. No need to add salt or pepper, the pastourmas will flavour the eggs. 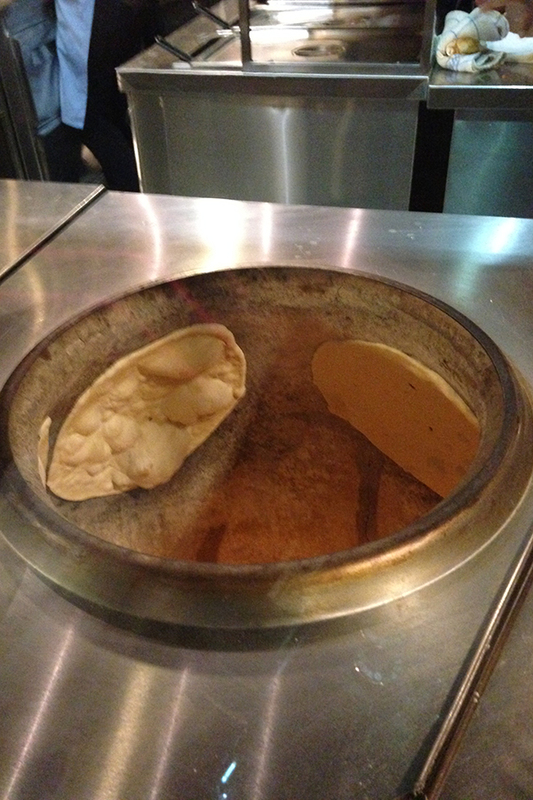 If you don’t like your egg yolk runny, flip over the eggs and pastourmas to cook the yolk. Serve immediately with some chunky bread. Serves 1. 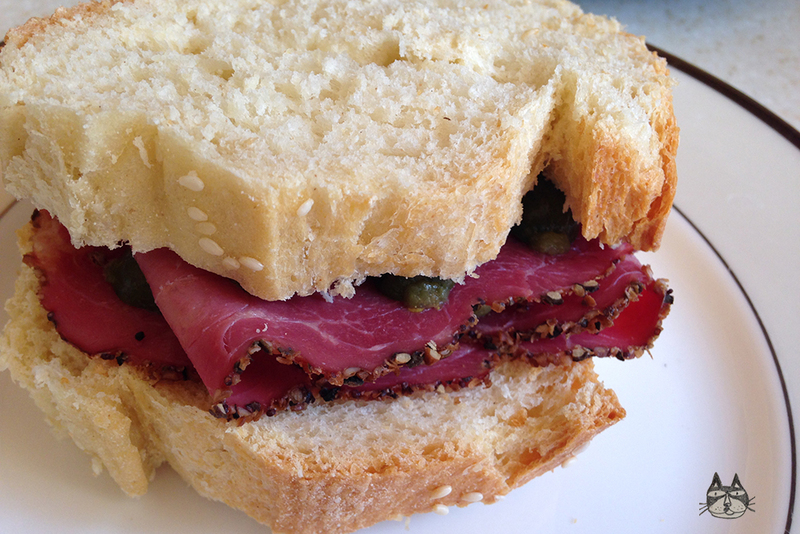 Other than pastourmas, I also bought some slices of beef pastrami, that I made into a simple pastrami sandwich – slices of pastrami with sliced gherkin pickles, with hot spicy English mustard on slices of chunky bread. We stopped by a few other places, too, but I will keep that for another post! Don’t forget to check out my friend Alison’s page, too! Also, to clarify, ‘makan’ means eat in Malay, and ‘Makan-makan’ roughly translates to “eats” in the plural form. So, Athens Eats! Welcome to the new series, and if you have any recommendations, please drop me a line!